This busy 41 year old business executive and mother of two came to see us with the chief complaint that she looked tired and felt “old” among her coworkers. She felt like it was pointless to even bother with her eye makeup because it just looked “smooshed” together all the time. 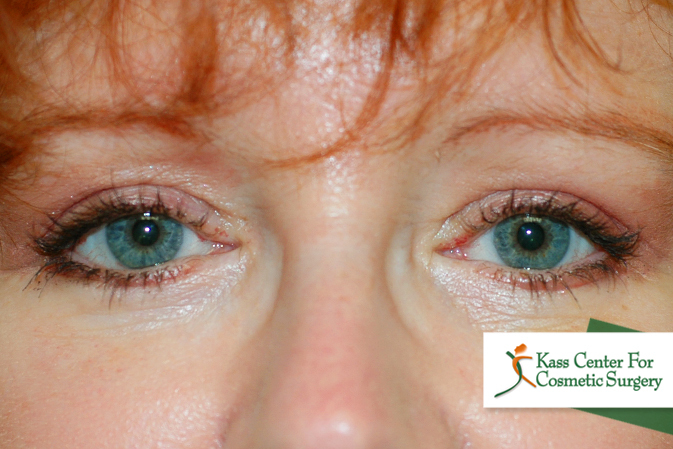 After consulting with Dr. Kass, she quickly decided that Bilateral Upper and Lower Lid Blepharoplasties (“Eye Lifts”) with Endoscopic Brow Lift was what she wanted. Shortly after her surgery, she proclaimed that she no longer look tired or old and was already happily wearing make up! 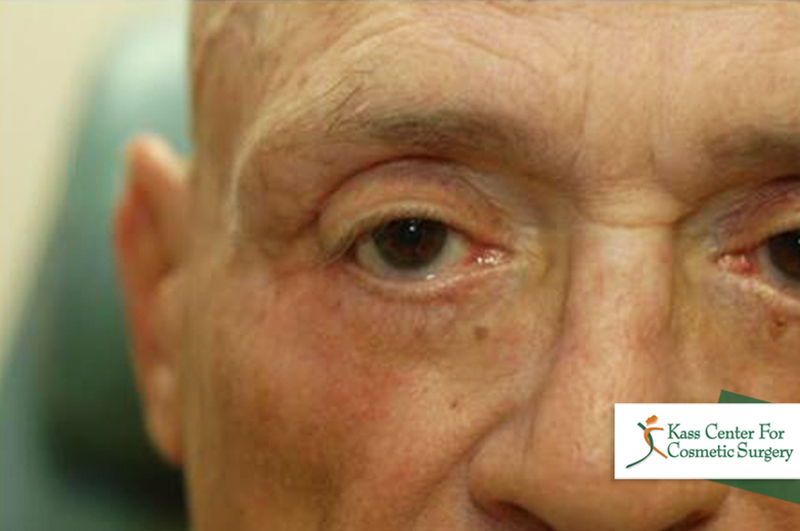 This 73-year-old man with rheumatoid arthritis and on blood thinners stated that he had to hold his upper lids up with his fingers to see. 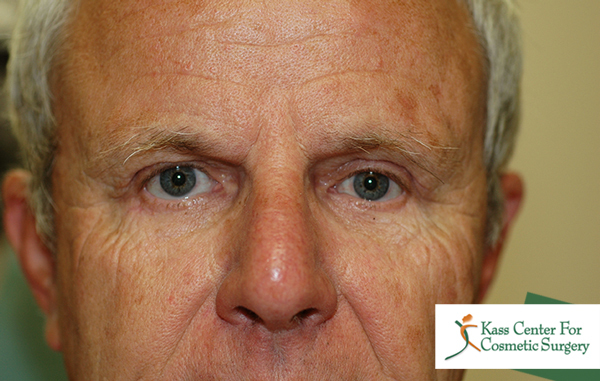 After discussing his options with Dr. Kass, he elected to proceed with bilateral ptosis repair of his upper lids, combined with upper and lower eyelid lifts, and endoscopic forehead (eyebrow) lift procedures. Despite his male pattern baldness, the tiny incisions in his forehead healed perfectly and truly could not be seen. He was amazed by how much better he could see! And about how much better he felt about himself after his surgery. This active 57-year-old male presented to Dr. Kass only because his wife insisted that she was no longer willing to be in the car when he was driving. She had noticed that he no longer seemed to see the cars to the sides of him while driving. 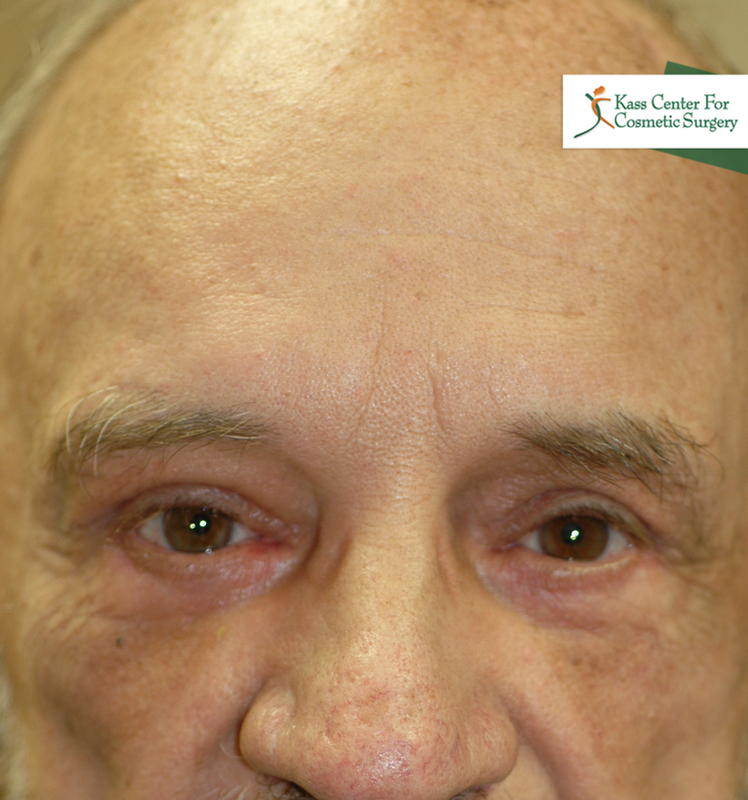 He requested surgery on his “loose skin” to help him see better. 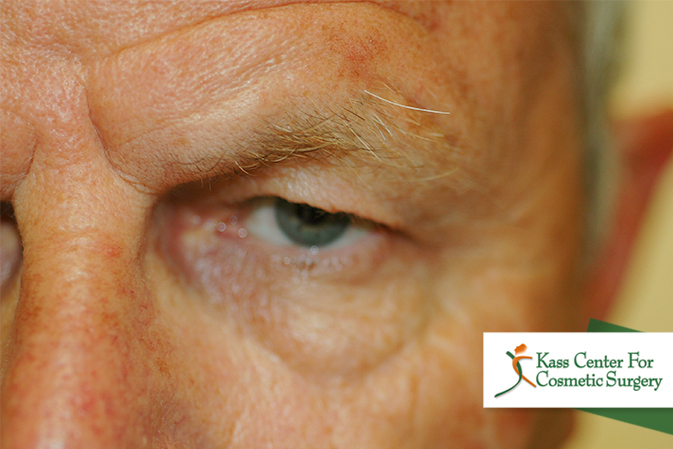 Dr. Kass said that he would be happy to do his upper eyelids but the deep lines on his forehead imparted an angry, mean appearance and they could be softened with a forehead lift. 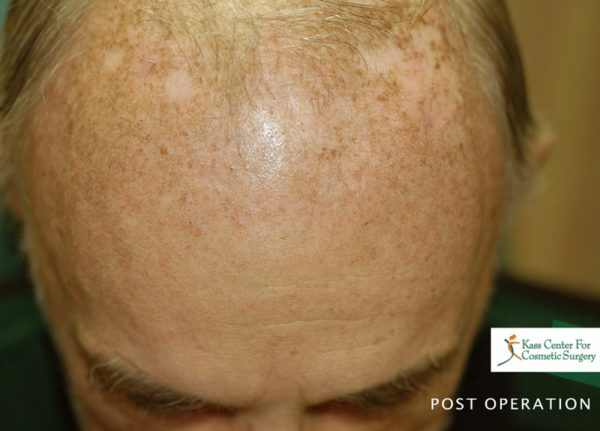 By using an endoscopic technique, only tiny incisions on the scalp would be necessary and these would heal beautifully even on men with little hair as in this patient. 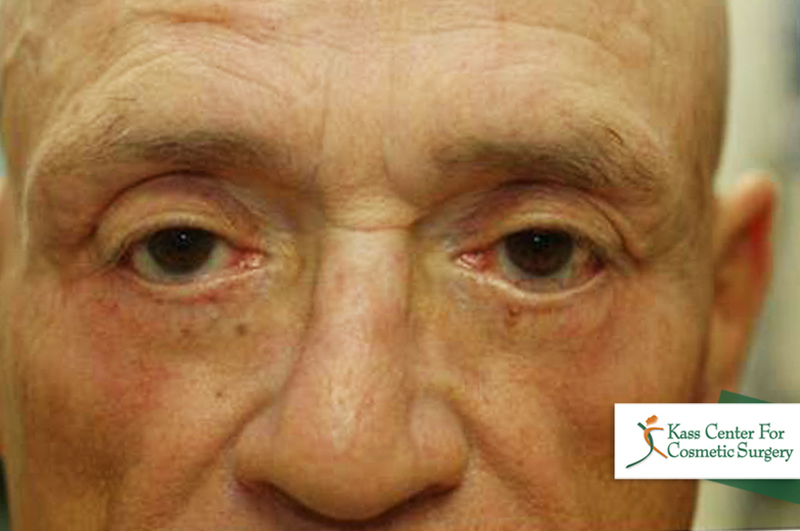 The patient had the surgery on his upper eyelids covered by his insurance, and then elected to have an endoscopic forehead lift and his lower eyelids done at the same time. 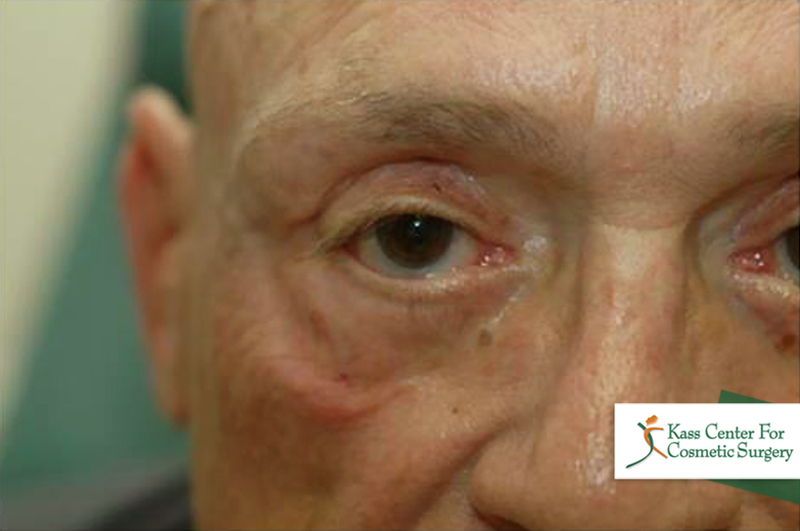 As promised, the incisions were practically imperceptible, and the patient (and his wife) were ecstatic both with his improved vision and with his softer and more natural appearance. 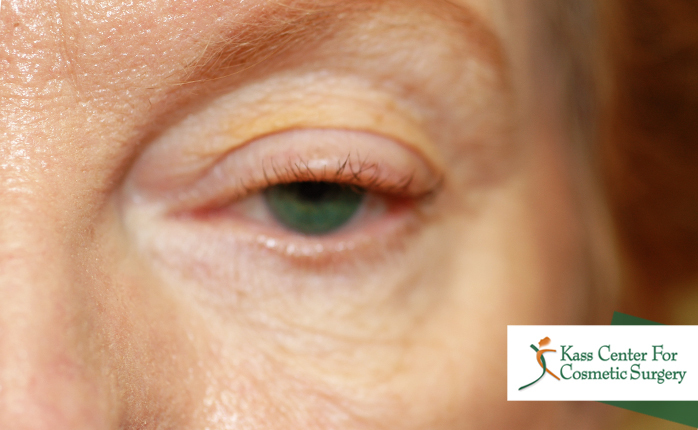 This smart, attractive 63 year old lady came to see me stating she felt her eyelids were drooping into her eyesight and she wanted them lifted ASAP. More than anything else, she feared that surgery might make her look artificial or unnatural. 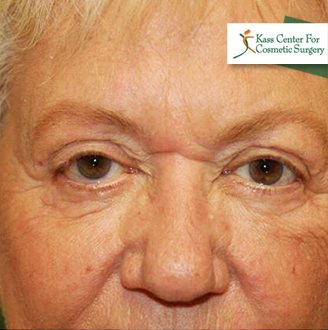 Paying careful attention to her concerns, Dr. Kass performed conservative upper and lower eyelid surgery on her. 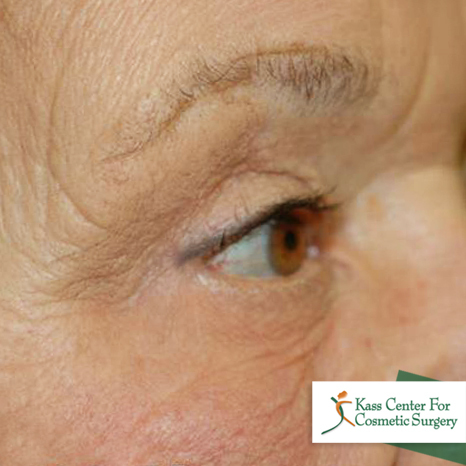 At her last visit to our office, she couldn’t thank Dr. Kass enough for her rejuvenated appearance and natural results. What a rewarding feeling! This 65-year-old woman complained that her eyes felt extremely heavy while reading. 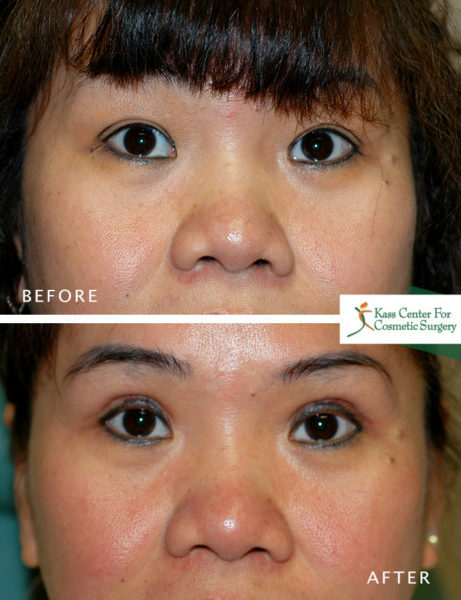 She underwent bilateral ptosis repair of her upper eyelids, and cosmetic upper and lower eyelid lifts (not apparent in these photos, she also had face and neck lifts and a Hetter resurfacing peel all at the same time). The patient stated that she would do this surgery again in a heartbeat! She stated that it took ‘20 years off’ of her appearance. And she was right! 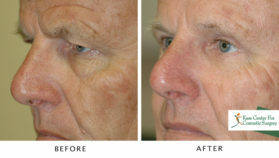 This active 70 year old man came into the office with heavy upper lids and complained of lower eye bags. 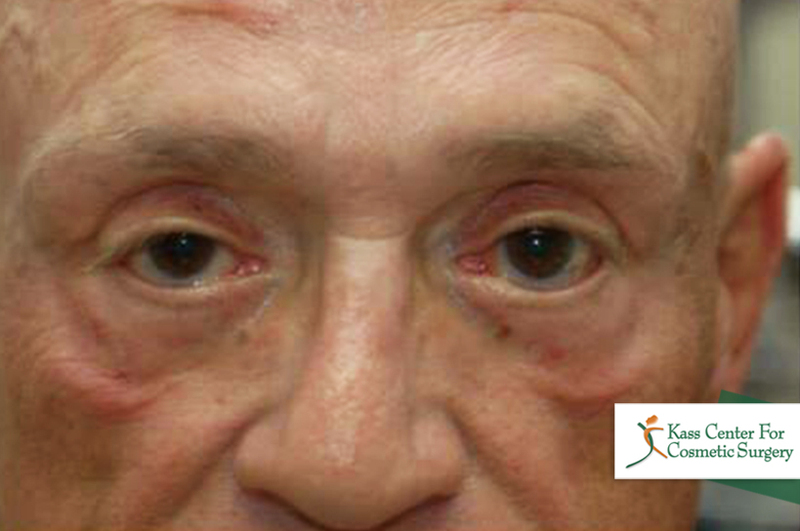 Although we asked if he just wanted to do his upper eyelids, the patient was adamant about wanting his lower eye bags treated too. 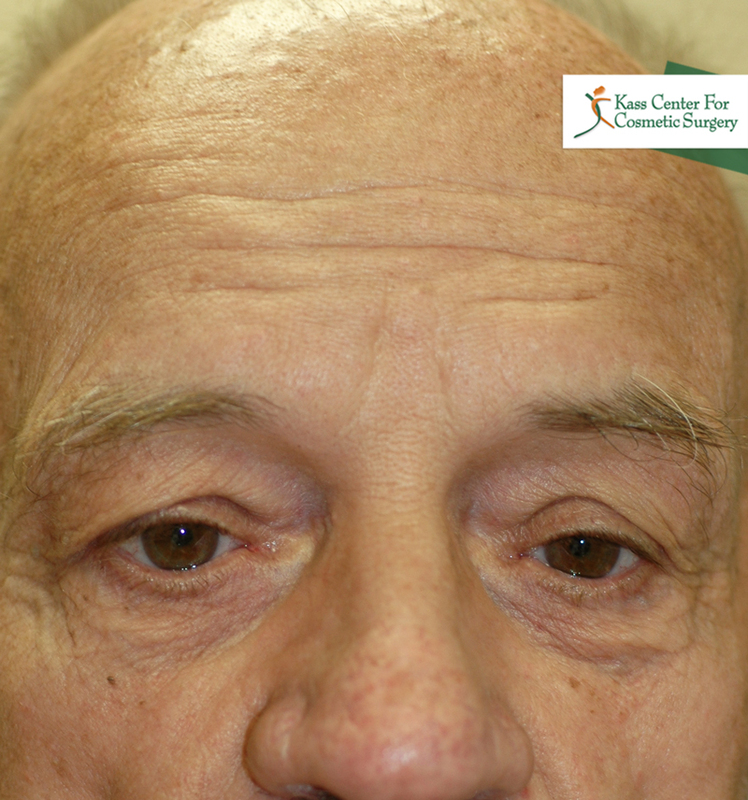 Shortly after surgery, he confided that he was amazed how much more he could see and how much better he looked! His eyes didn’t feel “heavy” or “puffy” ABOVE or UNDERNEATH anymore. Dr. Kass performs these procedures day in and day out on both males and females and he continues to amaze his patients with their results. 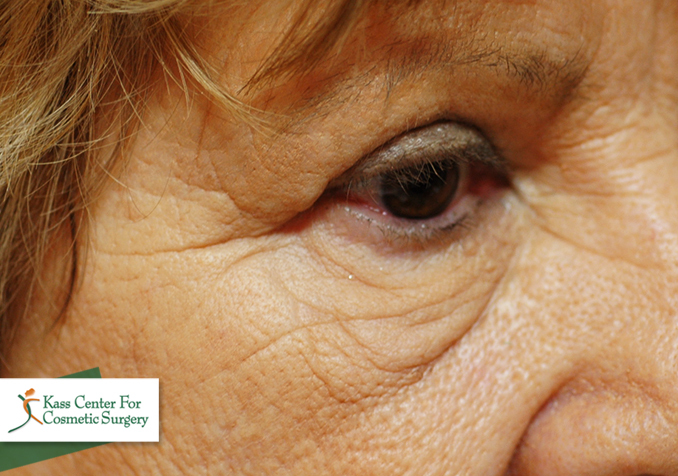 This 71-year-old woman came to me complaining of her droopy upper eyelids (Ptosis). 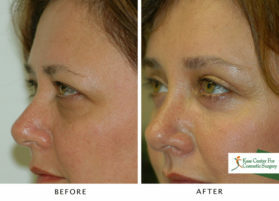 Once she realized how much more could be done to improve her appearance, she underwent medically necessary Ptosis repair of both upper eyelids, upper and lower cosmetic eyelid procedures, endoscopic forehead and midface (cheek) lifts, facelift, neck lift with suture suspension platysmaplasty, and facial resurfacing with the Hetter chemical peel procedure. She was thrilled! 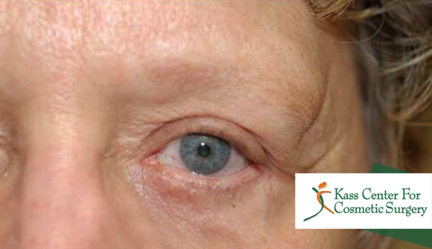 This spritely 72 year old came to the Kass Center complaining she felt like her eyes made her look older than she felt. 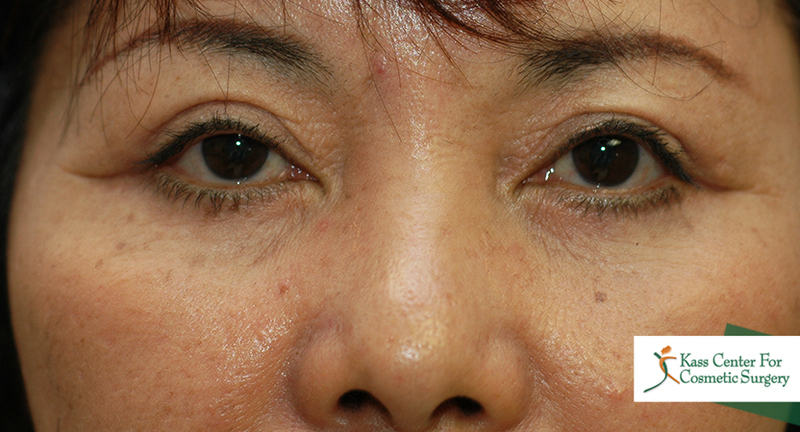 Bilateral upper and lower blepharoplasties with festoon treatments were performed on her. She remarks at all her post-operative visits how her baby blue eyes sparkle now, just like they did when she was young. She is a most enthusiastic lady and has referred numerous of her country club friends to see us. 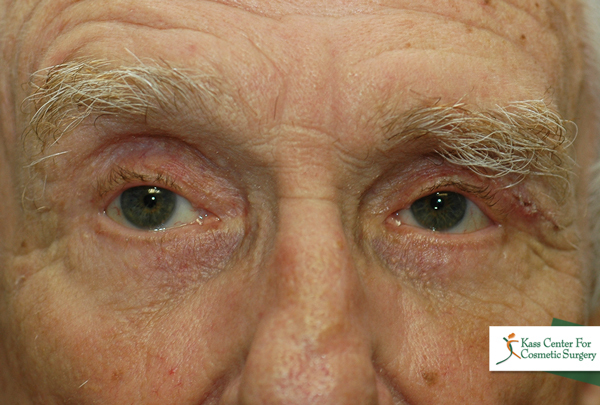 This pleasant, spritely 82 year old man presented to Dr. Kass complaining of excess skin above and below his eyelids. He stated that it was constantly interfering with his vision, and that it looked like he had sagging eyes. 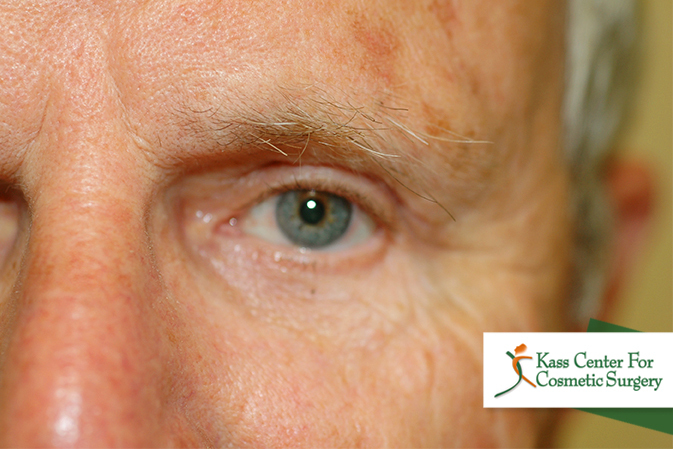 After several consultations with other doctors, and much research, he decided to have bilateral ptosis repair and a four lid blepharoplasty with Dr. Kass. 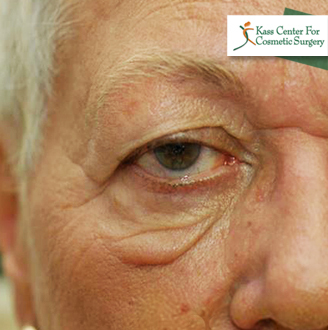 Because of the patient’s age, Dr. Kass suggested that perhaps the lower eyelids did not absolutely need to be done. But it was what the patient wanted. 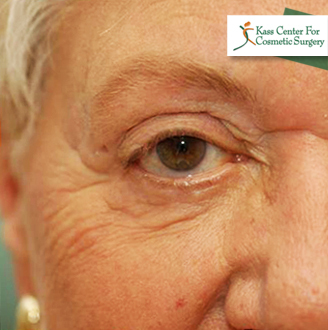 Once the patient was healed, he stated that he felt 10 years younger, and that his sight had improved dramatically. He was more than pleased with his results, and was going to recommend Dr. Kass to all of his friends and family, because he only wanted them to see the best doctor that he had! 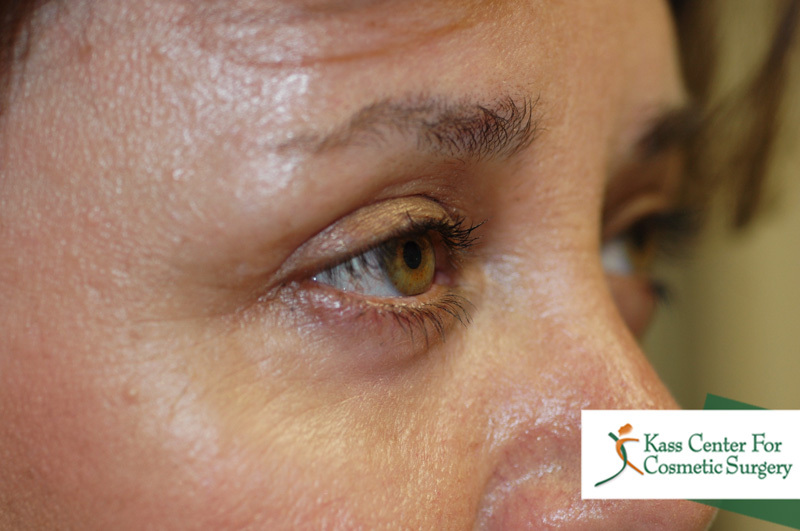 This patient came to see Dr. Kass complaining that when at work she felt that everyone was staring at the bags under her eyes. 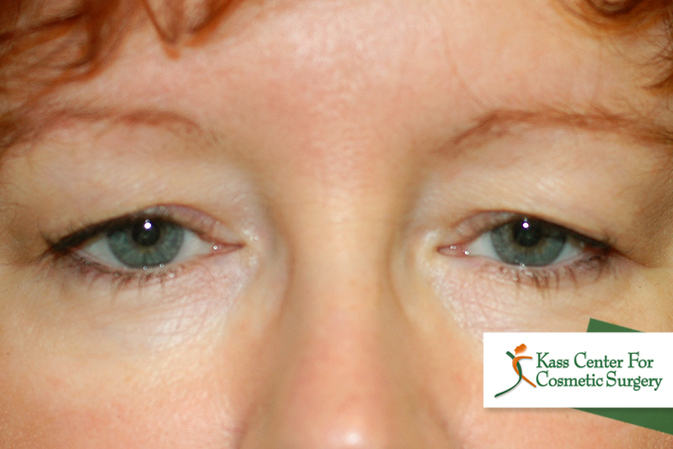 Dr. Kass explained that in addition to eye bags she had a condition known as festoons. 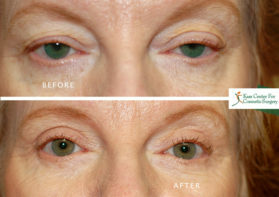 He explained that to treat the eye bags without treating the festoons would leave her looking worse than before surgery. She elected to proceed with bilateral lower eyelid surgery and festoon treatments along with a full face Croton Oil / Hetter Facial Peel Procedure. 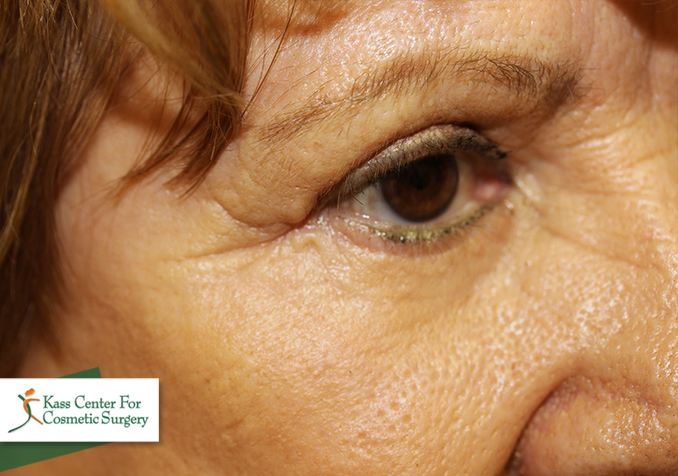 She demonstrates a near perfect result from these combined procedures. 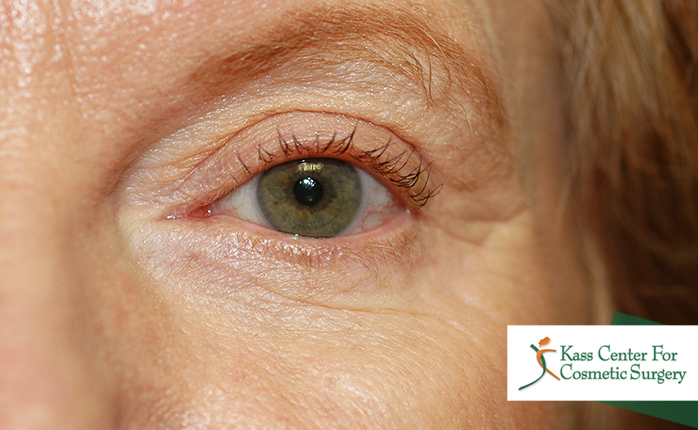 Look at the difference in the lower eyelid bags and the festoons! 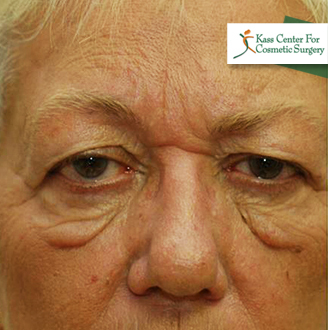 But don’t miss the distinct improvement in the rejuvenated appearance of her cheeks! 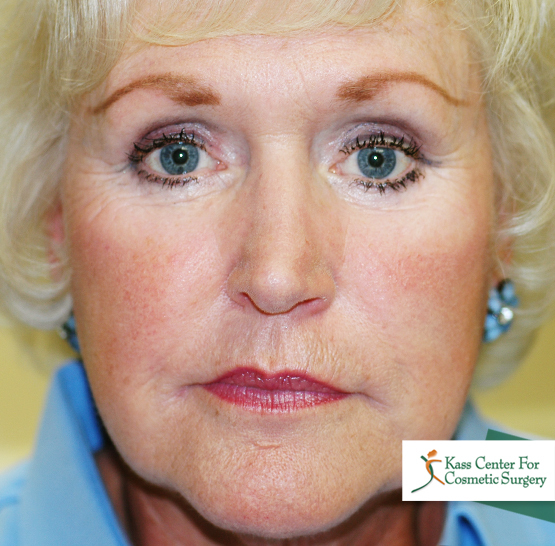 The patient thought that the surgery took years off of her appearance, and she thanks us to this day for giving her back her confidence to continue to work. 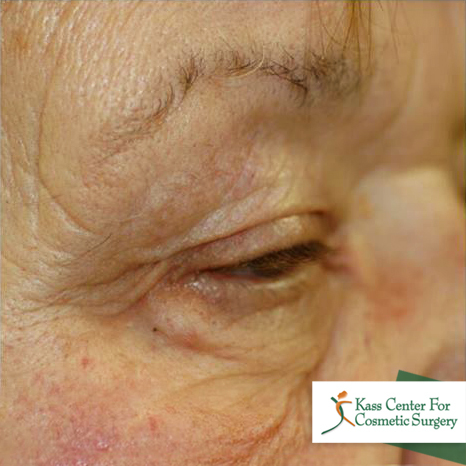 This very sweet 69-year-old patient came in complaining of bags, known as festoons, under her eyes. 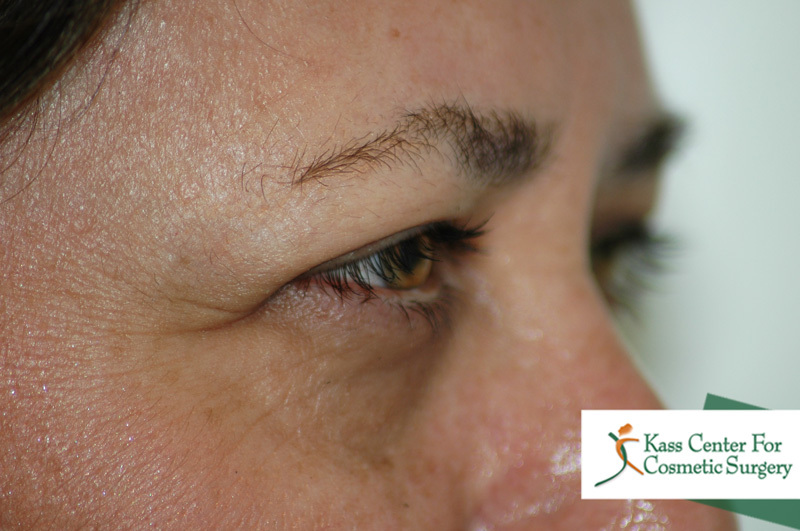 Although many patients, across the country, have told Dr. Kass that their plastic surgeons had said that nothing could be done for these unsightly bags, this is simply not true. Please look at these photos and decide for yourself! She received festoon treatment with under eye skin resurfacing using the Hetter Facial Resurfacing Procedure that Dr. Kass has perfected in 14 years of use. This patient was so very pleased with her results after this treatment, she is presently contemplating procedures with us. 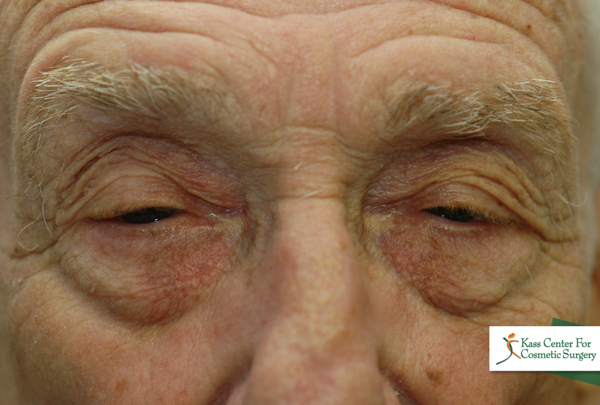 This patient hated the appearance of his lower eyelids. 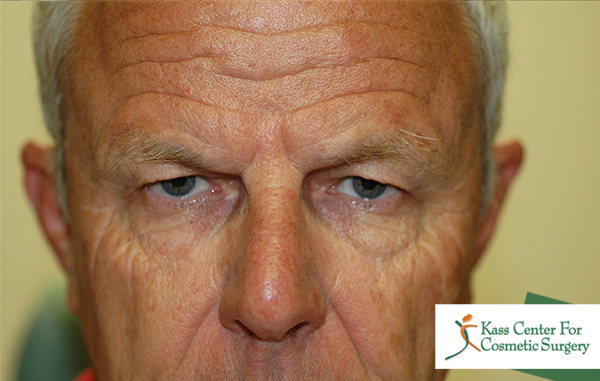 After turning 66, this patient decided it was time to have his festoons removed and went to see his plastic surgeon. That doctor, recognizing the difficult nature of festoon treatment, referred the patient to Dr. Kass, knowing that there simply was no substitute to the vast training and experience of an eye and face plastic surgeon in treating this difficult area. The patient felt that his festoons made him look much older than he actually was and that it was all anyone ever looked at while speaking to him. After his consultation, the patient booked his surgery that very same day and was able to get in within 2 weeks for the procedure. At his final post-operative visit, the patient said that the results are more than he could have hoped for, and was so glad he made the decision to come see Dr. Kass! 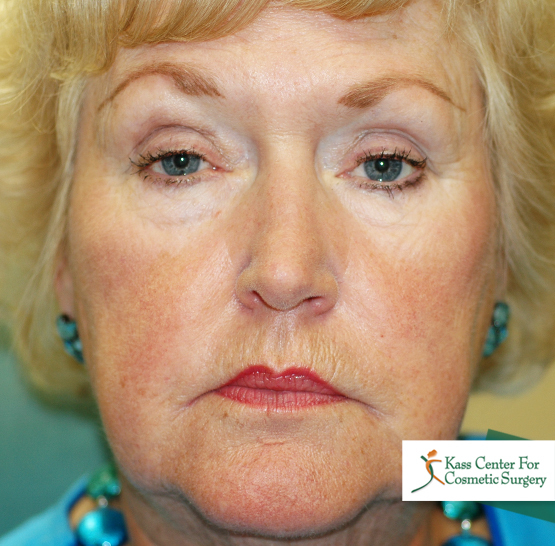 This patient presented to Dr. Kass complaining of not being able to wear eye shadow, and it was making her feel like less of a lady. She had given up all hope until she found Dr. Kass. 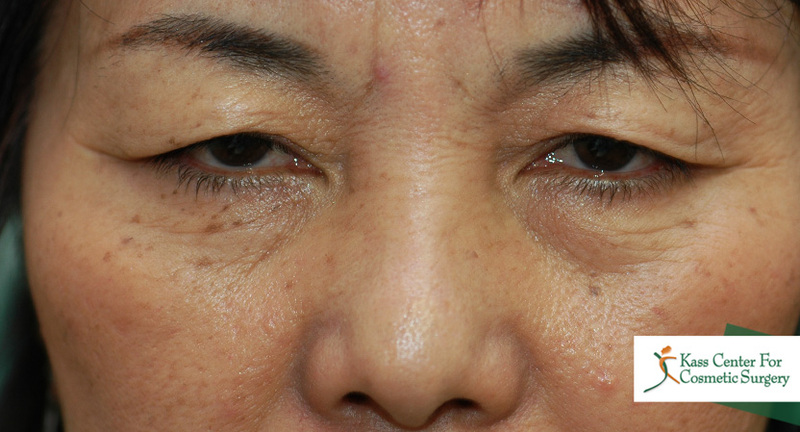 The patient wanted a more westernized look, without looking like she had extensive surgery. After several consultations with Dr. Kass, she felt that she was choosing the right doctor, one who could exceed her expectations. 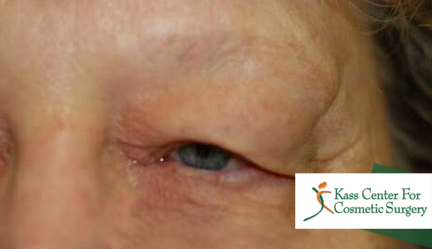 Dr. Kass performed an Asian Blepharoplasty procedure combined with transconjunctival “no visible incision” lower eyelid surgery. 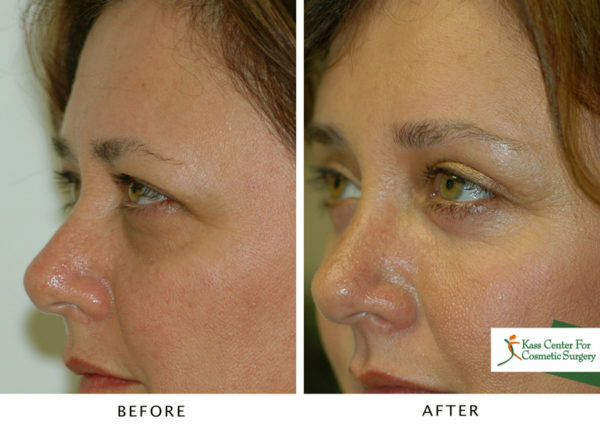 Although Dr. Kass noticed some residual asymmetry after the procedure and offered to make a minor adjustment to the lids, the patient declined this saying that she was already ecstatic with her results. She said that she couldn’t wait any longer to test out all her new eye shadow colors, and felt that she already looked like she had always wanted to!